Max Verstappen shoved Esteban Ocon three times after he dramatically squared up to the driver who robbed him of a brilliant victory in Brazil. 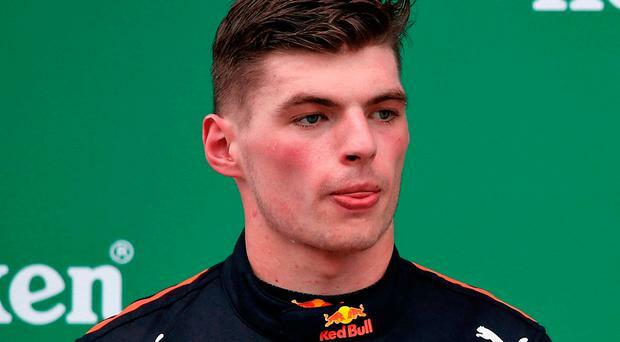 Verstappen (21) had been in complete control of the Interlagos race, following a fantastic performance in which he passed all four Mercedes and Ferrari cars, only to be taken out of the lead when Ocon, a lap down, dramatically crashed into his Red Bull. Lewis Hamilton picked up the 10th victory of his championship-winning campaign - completing a remarkable half-century of triumphs from his last 99 starts - but it was Verstappen's crash with Ocon, and their jaw-dropping confrontation captured by television cameras, which took centre stage. Verstappen was still seething with rage after the incident on lap 44. Ocon went wheel-to-wheel with the Red Bull driver at 220mph, before the Frenchman banged into the right-rear of Verstappen's car through the Senna Esses, sending him into a race-losing spin. "What an idiot," Verstappen fumed over the radio before he recovered to finish second. "I don't know what to say," Verstappen's race engineer Gianpiero Lambiase said in the seconds after the flag had fallen. "I know what to say," Verstappen replied. "I hope I don't find him in the paddock." The rest of his message contained a series of bleeped-out expletives. For the first time in nearly 40 years, Formula One saw its first fight on camera with some shoving. Following the stewards' investigation, Verstappen will now have to complete two days of community service for the FIA. Leading final Positions after Race (71 Laps): 1 Lewis Hamilton (Gbr) Mercedes GP 1hr 27mins 09.066secs, 2 Max Verstappen (Ned) Red Bull 1:27:10.535, 3 Kimi Raikkonen (Fin) Ferrari 1:27:13.830.